I have this NEW heat recovery unit from Amazon (shady quality, branded as made in UK but actually made in China) with this motor inside. It was supposed to have two speeds (Low/Hi). How to connect the wires? Assuming that BROWN and BLUE and the "main" 230V wires, where do I connect the BLACK and WHITE? Here is what I got by disassembling the unit. (Yes, the schematic I show is correct. I double checked.) Did they connected the capacitor to the wrong wire? The hand-drawn diagram in your question shows blue and red reversed. It is possible that is an acceptable means of reversing the rotation of the motor. 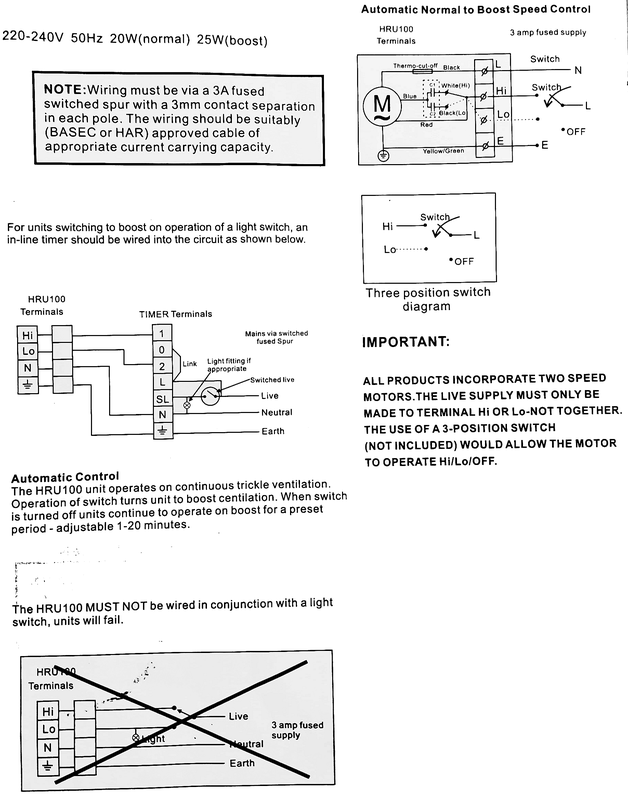 However it is also possible that the motor was manufactured with wire colors that do not match the manual. The resistance readings tend to indicate that interchanging the blue and red to reverse in not acceptable, but it might work even if it is not recommended by the manufacturer. If the heat recovery unit is a manufactured item that you believe to have been installed and working properly previously, you should probably assume that the internal capacitor connection is correct. Connect the HI LO switch to white and black, respectively. Connect neutral to brown. Connect the switch and blue to power to run. If at all possible, measure the current when you first turn it on and compare with the rated current. Also check direction of rotation. That will prove if blue and red are properly selected assuming the product is viable at all. Resistance values indicate black/brown/5 must be hot or neutral and red, blue, 2, 3, 4 must be connected to the opposite side of the line. Not the answer you're looking for? Browse other questions tagged capacitor motor ac wiring single-phase or ask your own question. 24VAC LED flood with 12VAC driver works on 12VDC—how? Soldering ACN/ACL (blue/brown) wires to outlet plug? Can someone confirm how to wire this air pump?